I live in the Midwest with my two daughters (ages 10 and 8) and my husband (age 45). We have a nice squirrel-proof bird feeder in our backyard that attracts numerous birds and provides the family with a lot of joy. My husband, it is true, only sporadically fills the feeder with seed — that’s consistent with a general domestic pattern — but that is not why I am writing today. One recent spring morning, moved by some unseen force, my husband — let’s call him “Chris Bachelder” — retrieved the large bag of seed from a coat closet. From the kitchen I could hear seeds spilling from a small hole in the bag and I naturally began to worry about mice. Honestly, I’ve never thought the coat closet was a good place to store the birdseed, and I’ve said so on a number of occasions, but that is not why I am writing today. My husband took the heavy bag outside to fill the long-empty feeder. It was a beautiful morning and we had just enjoyed a nice family breakfast. I could see “Chris Bachelder” where I stood at the kitchen counter, and I felt a stirring of enthusiastic affection, as you might feel for a family pet that has learned a basic command. After he hung the feeder from a branch, he walked back toward the house with a non-sluggish purposefulness that aroused my suspicion. And sure enough, upon entering the kitchen he began to behave erratically, rummaging through drawers for a pen and some paper, and sending our youngest daughter upstairs to retrieve his ancient digital watch. When she returned, he asked everyone in the family to guess how long it would take — in minutes and seconds — for the first bird to land on the feeder. “Now,” he said. “Quickly.” I made a face to indicate that I was not interested in participating, but then he made a face to indicate that he was disregarding my face. So we all guessed, and my husband recorded our guesses on a sheet of paper. Then he pulled a chair up to the French doors in the dining room and stared into the sunny backyard, his stopwatch running. Our girls were interested for a time, but soon they went upstairs to make bead jewelry. So there he sat, alone by the French doors, staring into our backyard, being careful not to make any sudden, bird-frightening movements. He sat there long after he had “lost” this “contest.” There were birds that flew past, birds that landed nearby, birds that came so close. He watched the backyard for 29 minutes and 12 seconds, when at last a bird — a dull sparrow — landed on the feeder and ate a seed. Our older daughter “won,” but did not seem particularly gratified. If “Chris Bachelder” wanted to look at our sunny yard, why did he not just look at our sunny yard? Why the scorecard, the stopwatch? 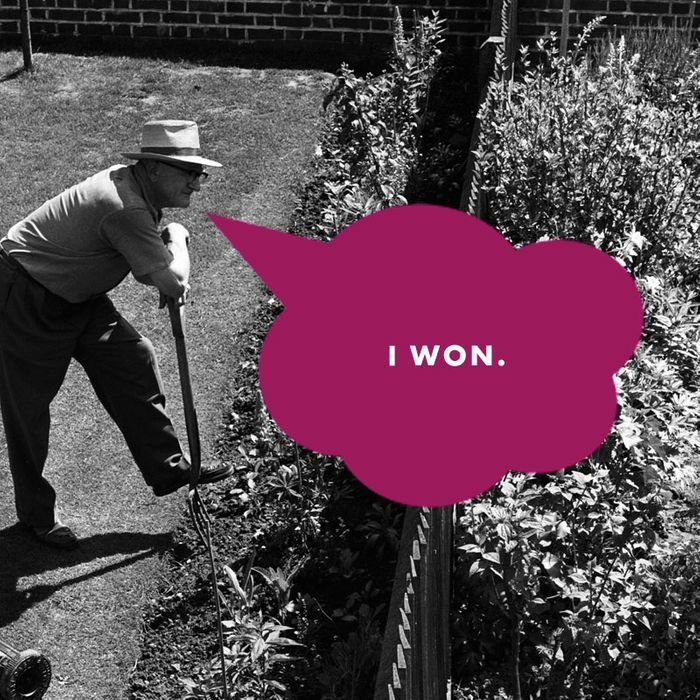 Why the compulsion to win or lose at yard-looking? What is wrong with him? Please help! Thanks for your letter. “Chris Bachelder” sounds like a fascinating husband. Why Would an Adult Man Play Video Games? Neddy’s wife, Lucinda, is with him poolside and their four daughters are off playing tennis. Neddy has no compelling reason to leave the neighbor’s pool — there is no exigency, no external conflict — and he certainly has no compelling reason to swim home. There is not some multi-car pileup in the Westerhazys’ cul-de-sac. Neddy is creeping toward middle age and he is just kind of feeling alive, you know? He realizes that his youth is waning, but he still feels youthful and vigorous and vital. He yearns for myth and drama, even if it must be imposed in a completely arbitrary fashion. A quest — even an impulsive, capricious quest — confers shape and meaning on his soft, suburban existence. Neddy, who has a “vague and modest idea of himself as a legendary figure,” thinks that this long swim might “enlarge and celebrate” the beauty of a splendid midsummer day. This quest, it elevates Neddy and his life. A seemingly mundane activity — yet another hung-over lap in another tony pool — is suddenly amplified by narrative, charged with meaning and implication. “Making his way home by an uncommon route gave [Neddy] the feeling that he was a pilgrim, an explorer, a man with a destiny.” Typically, we think destiny must be discovered, but if destiny can’t be discovered, then it must be invented, imposed upon a formless Sunday at the Westerhazy pool, which is fed, incidentally, by an Artesian spring. Neddy’s spontaneous and tragic decision makes sense only if you believe in a world that has glory and grandeur. With self at center. Even failure — like your husband’s noble failure to guess accurately how long it would take for the first bird to land on the squirrel-proof bird feeder — can be glorious if it has a shape, a form. The form of pilgrimage, of exploration, of contest. Without contour, tension, purpose, ambition, challenge, or stakes, a sunny day is just a sunny day. So rest assured, Flummoxed. Your husband merely has a modest idea of himself as a legendary figure. It’s completely normal. He might be annoying, but he is simply a man, mythic and unremarkable. Chris Bachelder’s new novel, The Throwback Special, is out now.